Stinky tofu, pig’s blood soup, and chicken feet, oh my!! 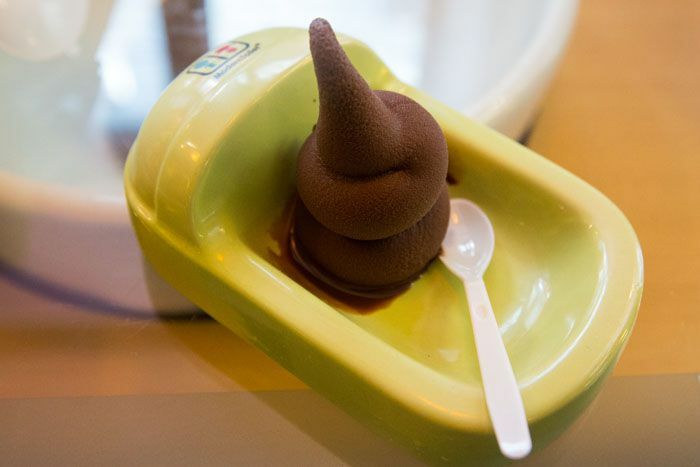 We ate some weird things while in Taiwan and believe it or not, we even ate out of a toilet. 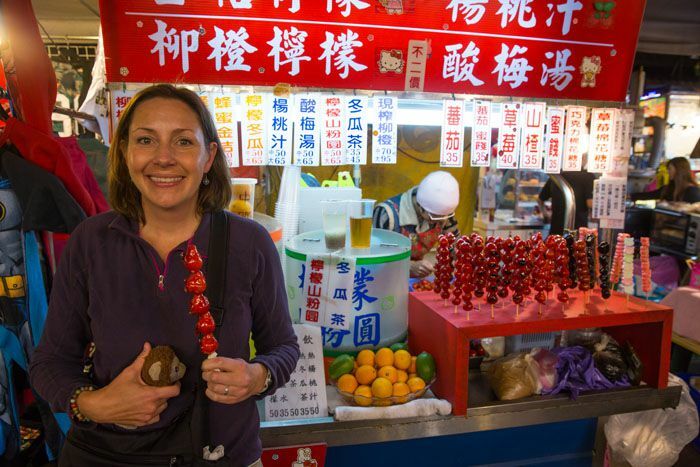 Our two weeks in Taiwan was a culinary adventure and tons of fun. We wandered through night markets, ate at delicious Japanese restaurants, and feasted on Dim Sum. 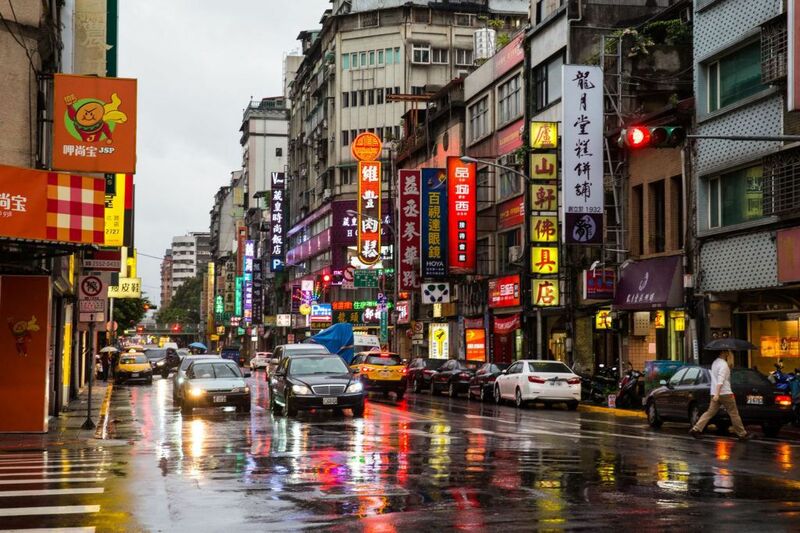 Here is our Taiwan food tour. Our food adventures began at a classy restaurant named “Modern Toilet.” It was a rainy day, we had spent all morning visiting a museum, and Tyler and Kara were ready to have some fun. We ate chicken curry out of a toilet, chocolate ice cream out of a squat potty, all while sitting on toilets ourselves. It was tons of fun and one of our crappiest meals yet. 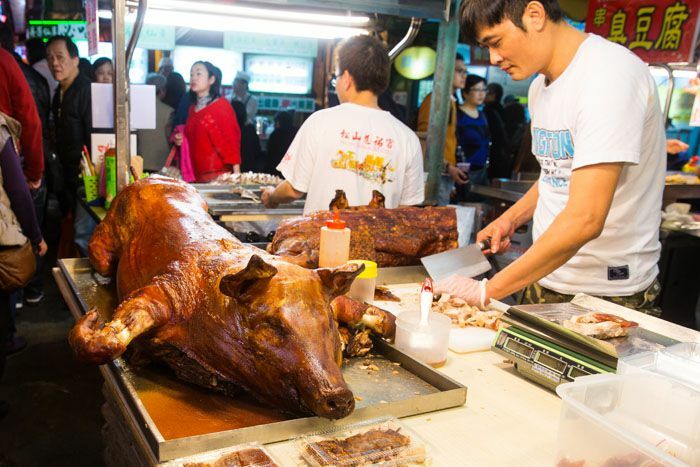 The night markets in Taiwan are legendary. Personally, I was a huge fan. 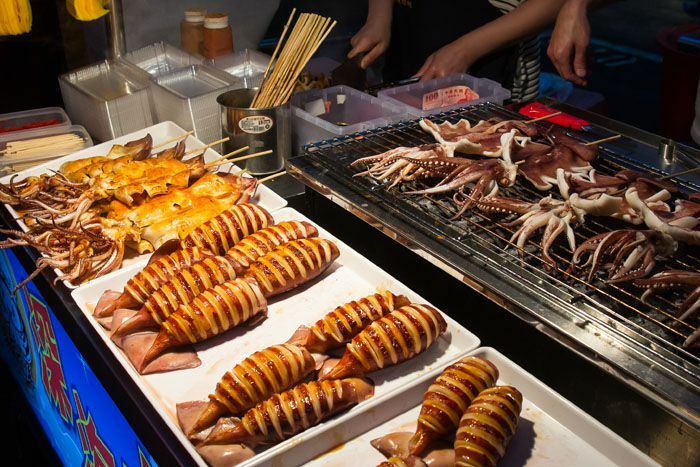 Where else can you try crazy foods you’d never see in the US for as little as a dollar. 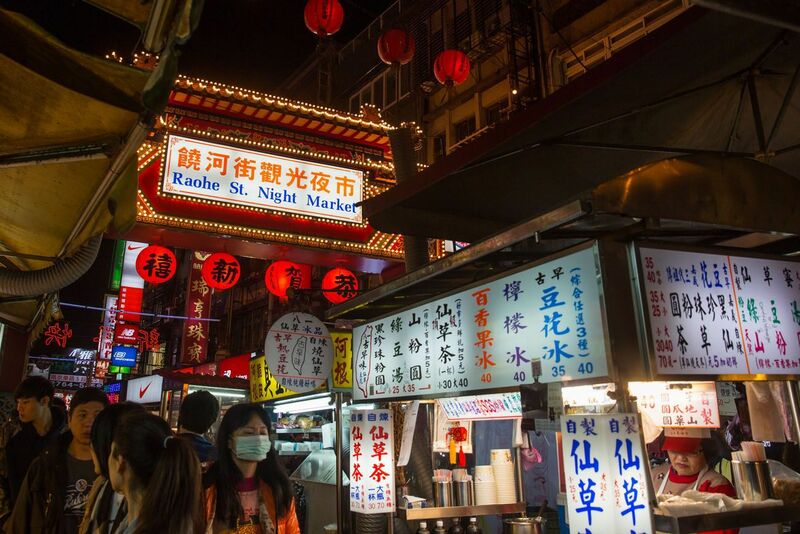 Raohe Night Market in Taipei was our first Taiwanese night market tour and looking back it was also our favorite. 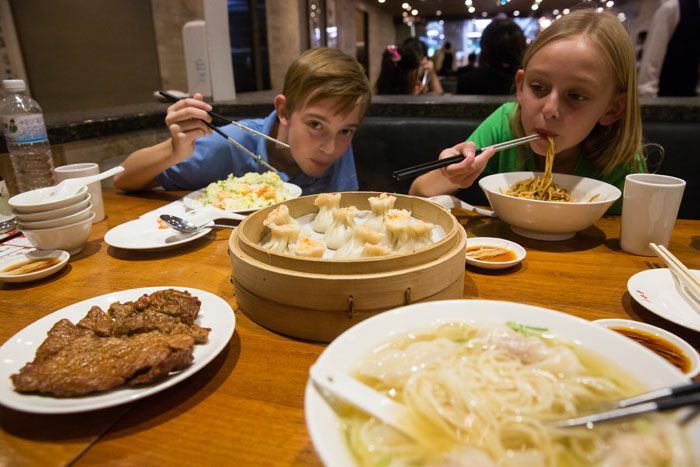 At Raohe there were enough odd foods mixed in with more recognizable and enticing foods, something to keep everyone in my family happy. Strawberries in a crunchy, sugary shell. They had tomatoes, too, but these seemed a bit odd. For dinner one night we ate at Sushi Motto and where Kara discovered her new favorite food was sushi. She was a huge fan of the conveyor belt with tiny plates of raw fish that kept passing in front of her. I am still a big fan of enormous bowls of noodle soup. 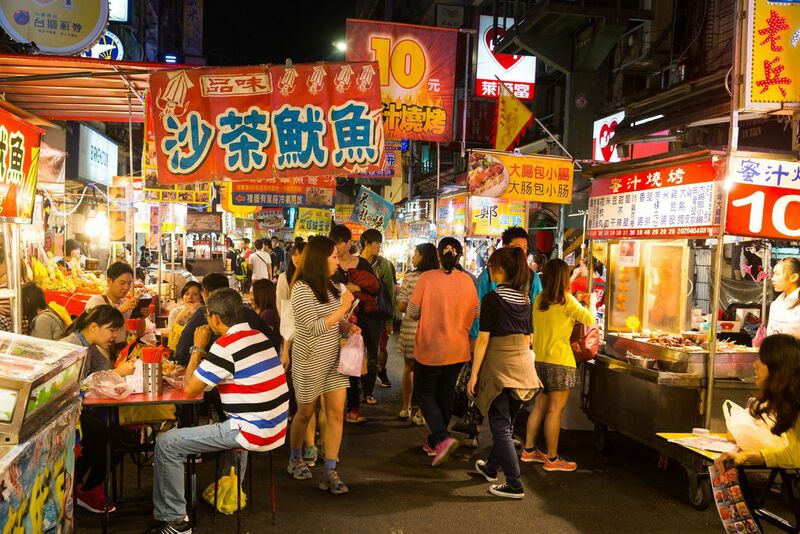 Our second night market was the biggest and supposedly the best in Taipei, the Shilin Night Market. We found it to be way overcrowded, turning what should have been a fun experience into something more like torture. We didn’t stay long, just long enough to sample some new foods. 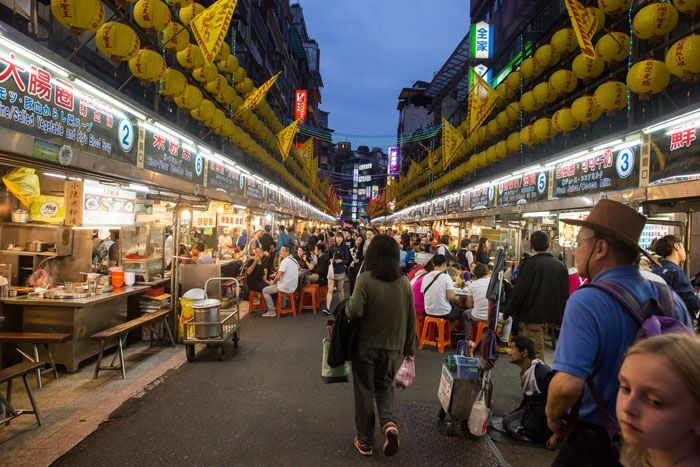 We hit our third night market in Keelung, a city just north of Taipei. We stayed here specifically to visit the night market. 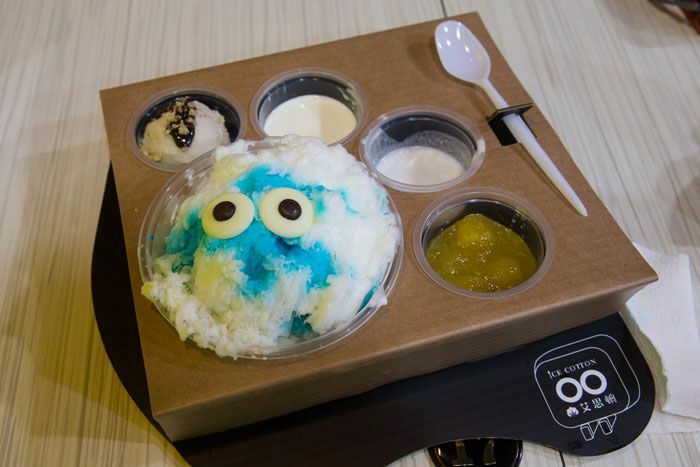 Here we saw (and ate) some of the strangest food yet. Pig’s blood soup was on my list of things to try and we found it right away here. 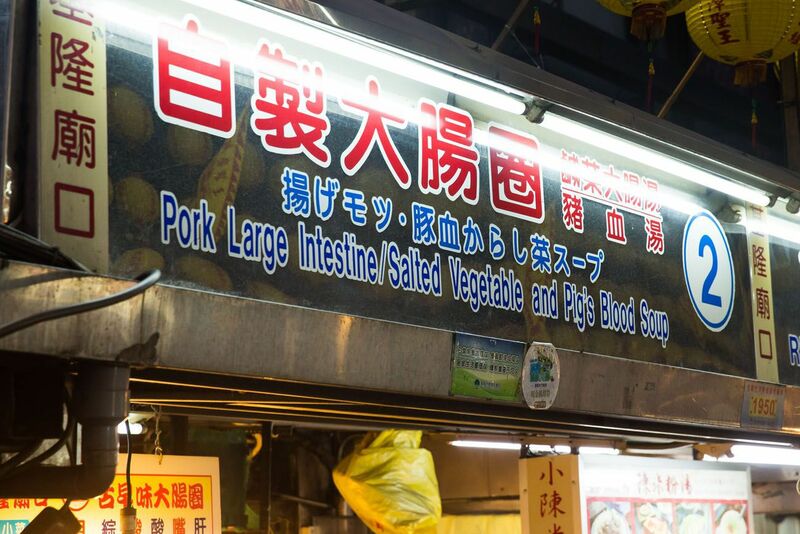 So, what is pig’s blood soup? 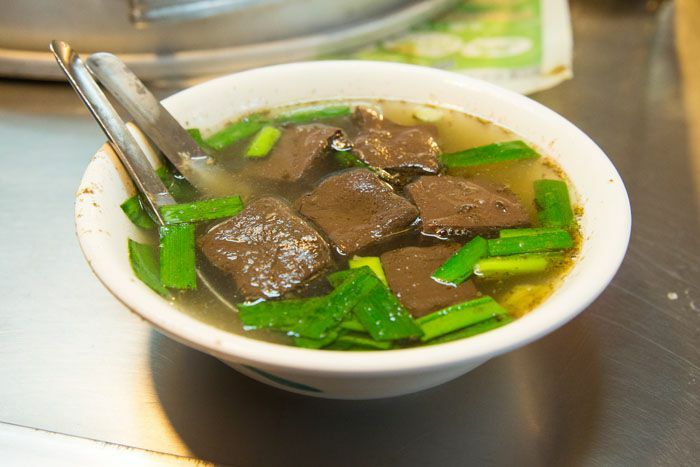 Floating in chicken broth are cubes of congealed pig’s blood, reddish-brown spongy blocks of blood. Honestly, the cubes did not have much taste but the broth was delicious. Tim, Kara, and I tried it and I was the biggest fan. 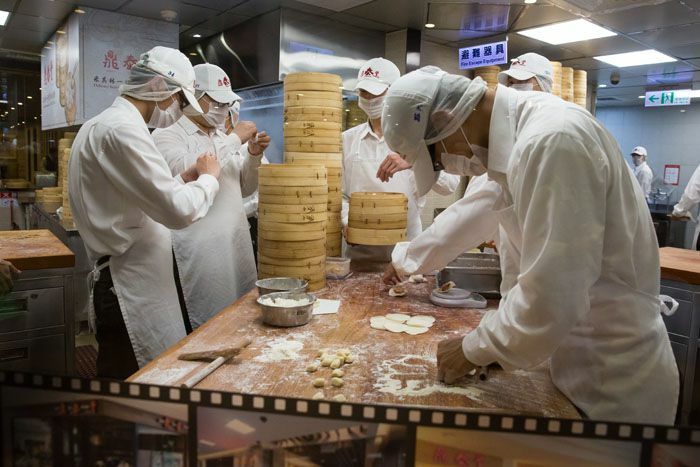 One of our favorite restaurants in Taiwan, and perhaps during our entire trip, is Din Tai Fung. 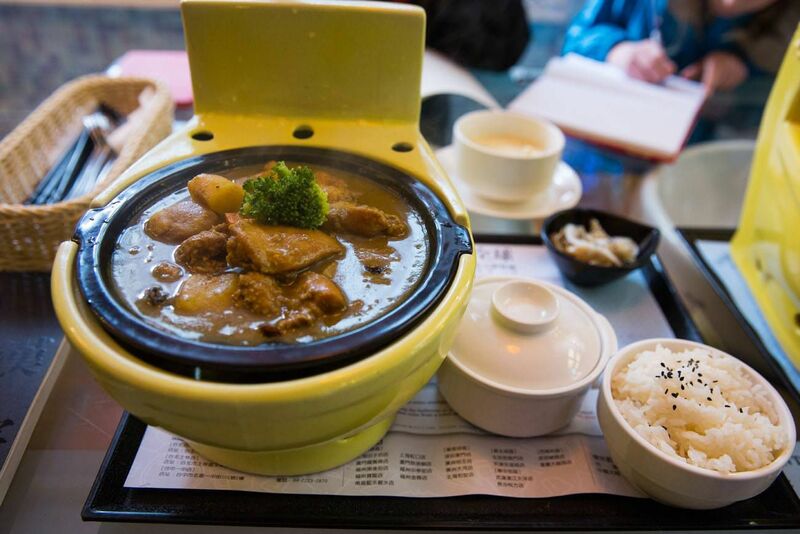 This Taiwanese restaurant is one of the most popular places to eat in Taipei. We ate dinner here, having dumplings, wontons, noodle and rice dishes, and the food was amazing. 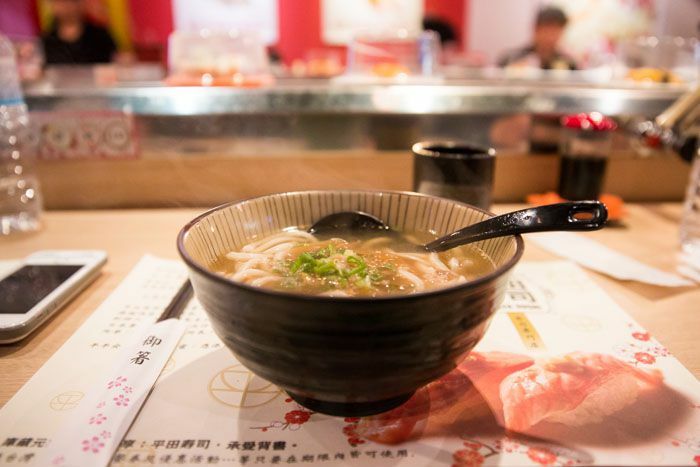 This is a chain restaurant and voted as one of the best places to eat in Asia. During our tour of the island we also stopped to eat here in Kaohsiung. This restaurant was so clean and so efficient. The chefs wore head coverings and face masks, so there’d be no stray hairs in our food. While we waited to be seated at our table we placed our order from the menu (in English and Chinese), making our wait time very short, and allowing them to feed as many people as possible. We need one of these in Maryland! Our Taiwan food tour ended at a night market in Taitung. As a side note, we were amazed at the number of cities that started with Tai…Taipei, Taitung, Tainan, Taichung. 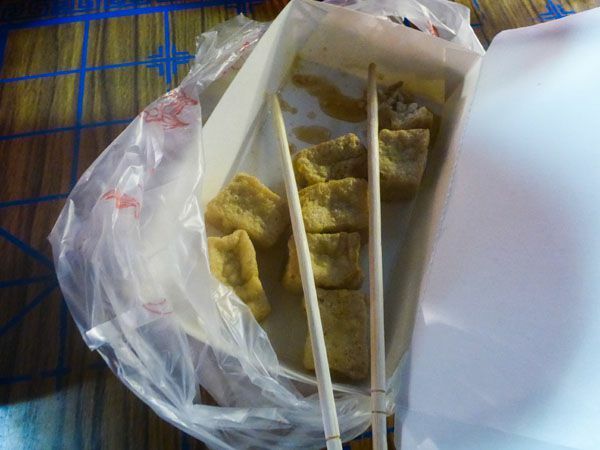 Anyway, it was at the night market in Taitung that we tried stinky tofu for our first time. 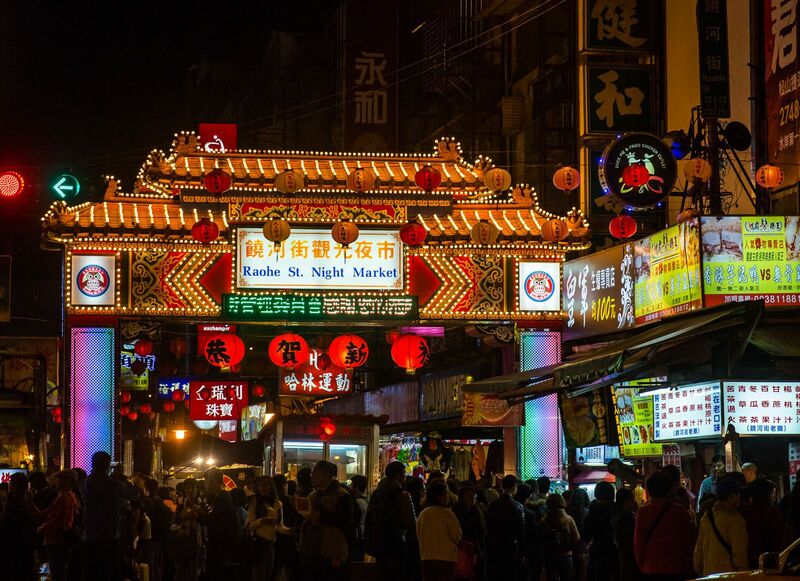 You can smell stinky tofu before you get to it. 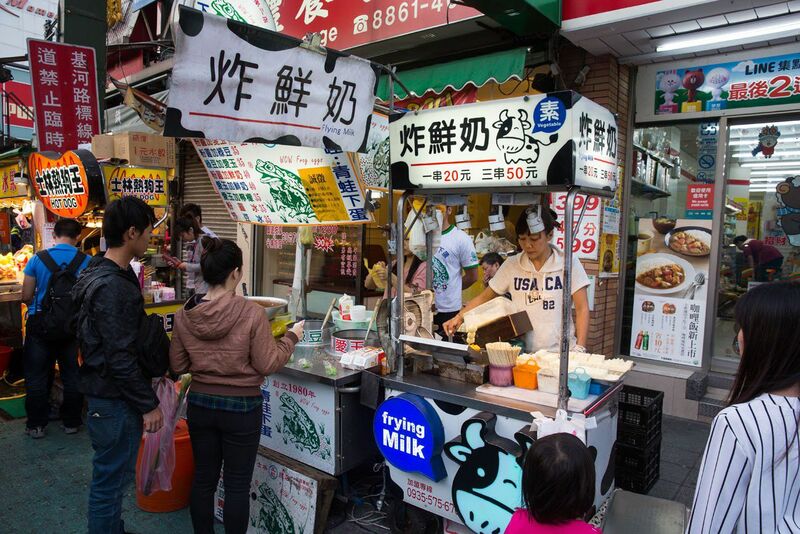 There is a terrible smell that permeates the air around the food stalls selling stinky tofu. Tyler didn’t even like to stand near them. 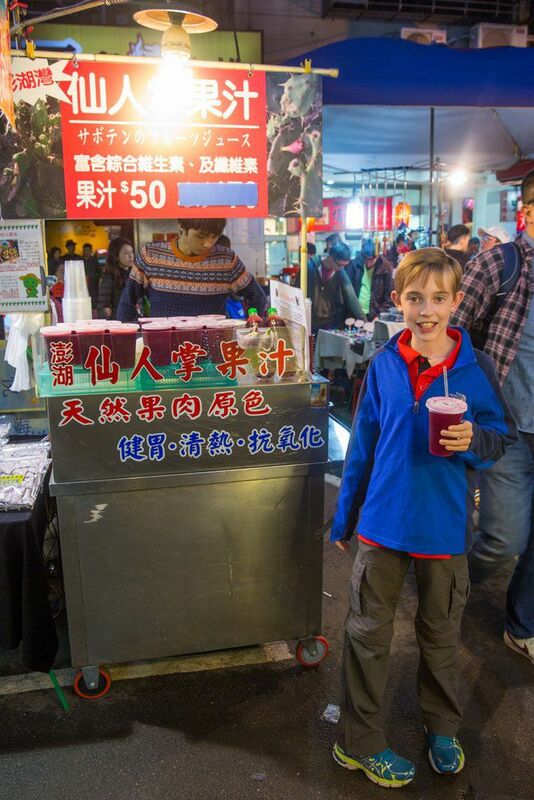 But we were in Taiwan, we had to try stinky tofu! Well, none of us liked it, and Tim and Kara were completely disgusted by it. It does have a taste of food past its expiration date. Somehow, people love it. While we were just trying to sample the stinky tofu, people around us were gobbling it down. 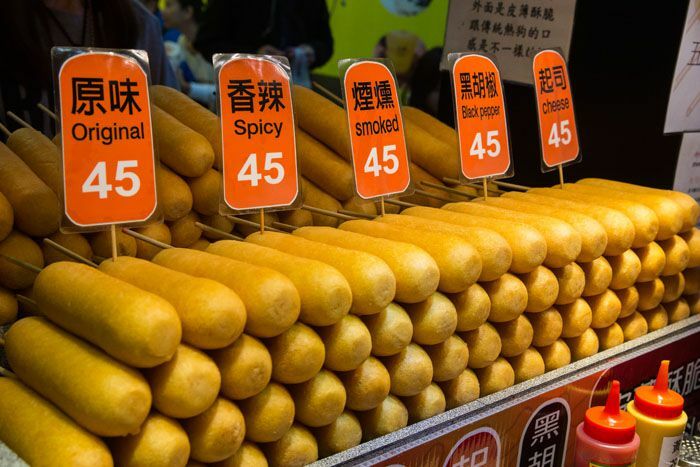 Taiwan was one of my favorite places for trying new foods. Some were delicious, some not so much. I think this possibly ends our chance to try anything new and crazy for awhile, because now we head south of the Equator, to places like Fiji, New Zealand, and Australia. 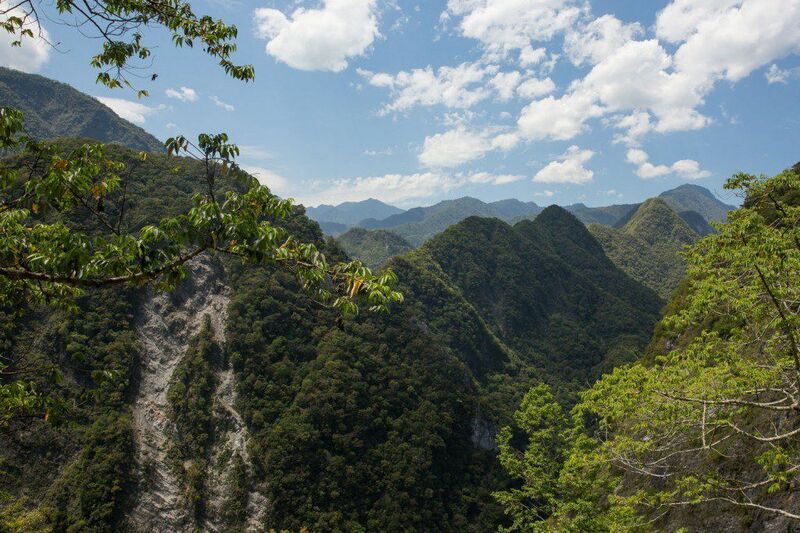 Are you planning a trip to Taiwan? 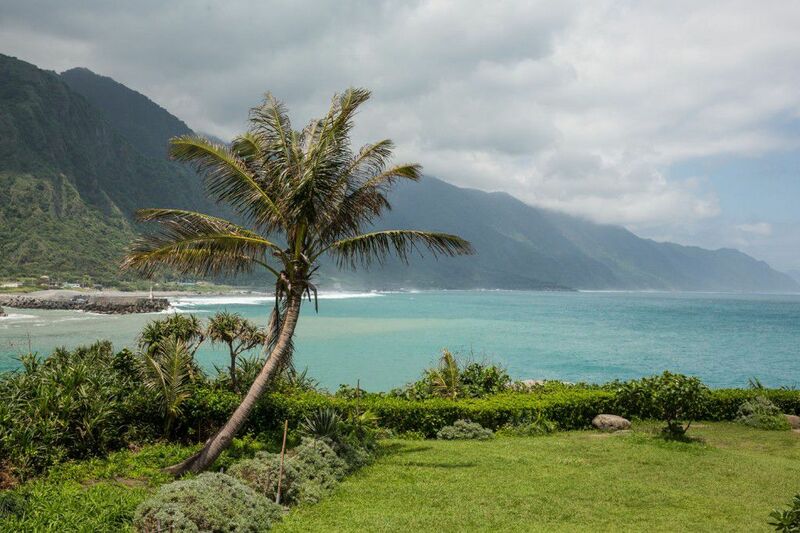 Read all of our articles about Taiwan in our Taiwan Destination Guide. > As a side note, we were amazed at the number of cities that started with Tai…Taipei, Taitung, Tainan, Taichung. You might ask: where is West of Taiwan? In fact, there is a place with such a name (Tai-si). But, it is not a city, albeit a small township! Stinky tofu is fermented. Like other fermented food, e.g. kimchi and sour cabbage, they smell spoiled and awful. But, the chemical links of the food have been broken down and transformed to something much easier to digest by the human body. Another famous fermented food is Nattō (なっとう). If you are not a Japanese, you can’t really tolerate its aftertaste in your mouth. But, part of longevity of Japanese is contributed by these fermented soybeans! Once you overcome the smell and the fear factor, it is just like cheese, another famous fermented product, which you might have enjoyed since childhood. 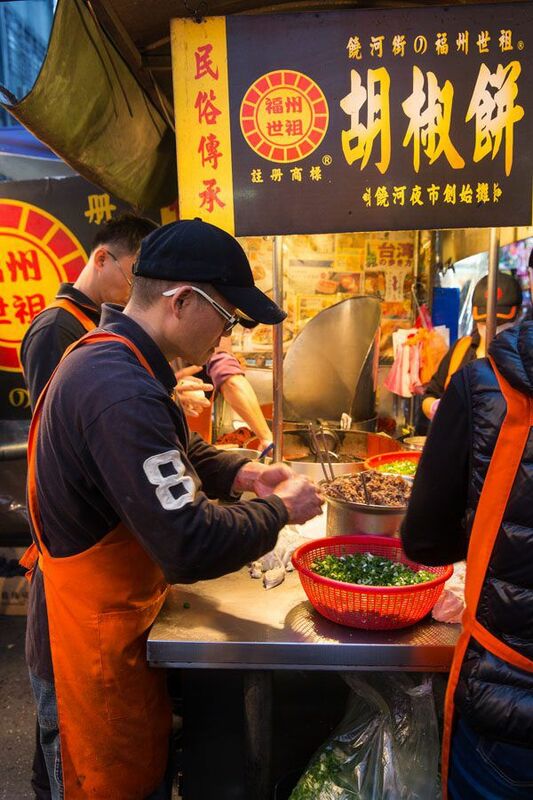 Julie, I just came across another blog about food in Taiwan. This makes me sooo hungry! I have totally enjoyed following your travels this past year. I will be sorry, as I am sure you will be, that this fantastic experience will come to a conclusion. But, there will be follow-ups, I’m sure. Life is an adventure. Thank you for your wonderful posts. That is a GREAT article! I wish I had read that before we went to Taiwan. 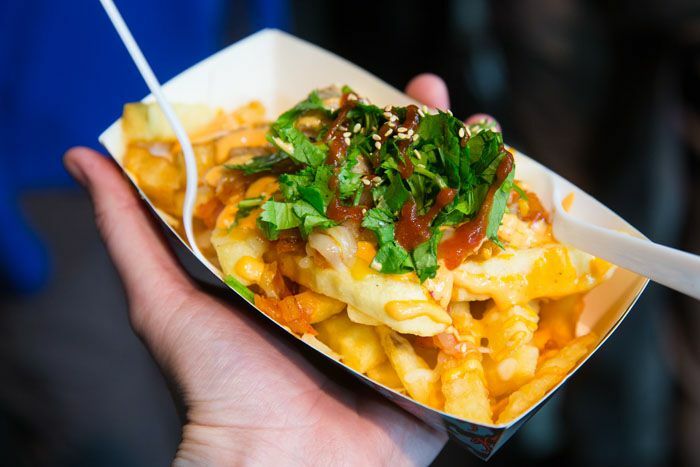 So many times we were wandering around, eating “mystery food!” Now I want to go back. 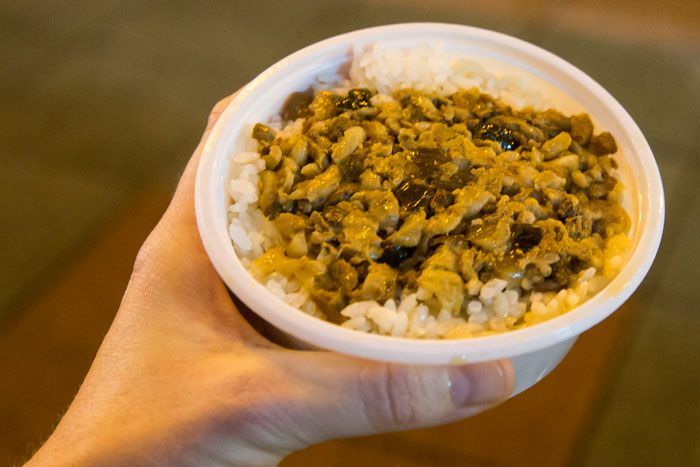 The street food and these night markets with their “small eats” is one of my favorite memories of Taiwan. Thanks for following us. Don’t worry, there will be plenty of follow ups and posts once we are home, I still have a lot to write about. And who knows, maybe we will go around again! !